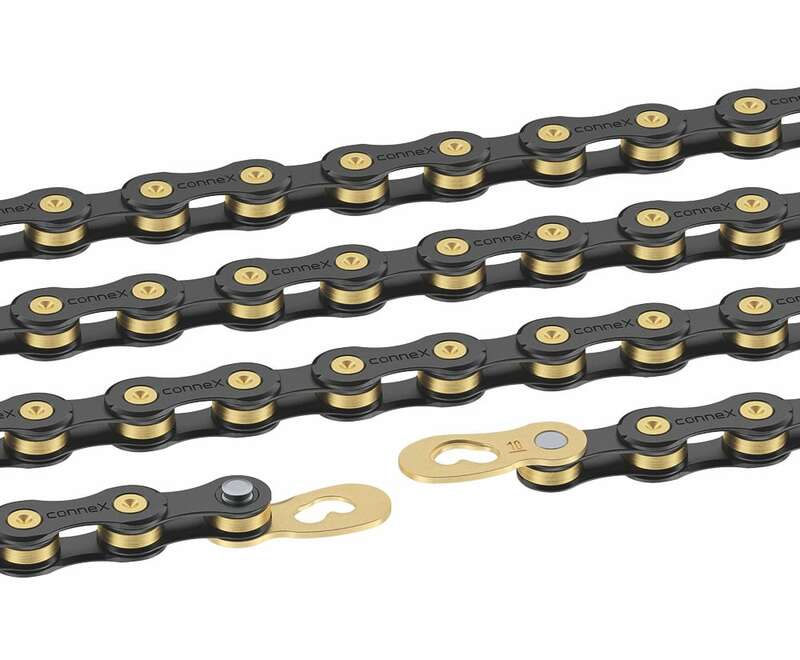 Wippermann in Hagen, Germany makes the most durable chains for bicycles you can buy. Why should you care? Because it's a worn chain that causes most chainring and cassette cog wear. 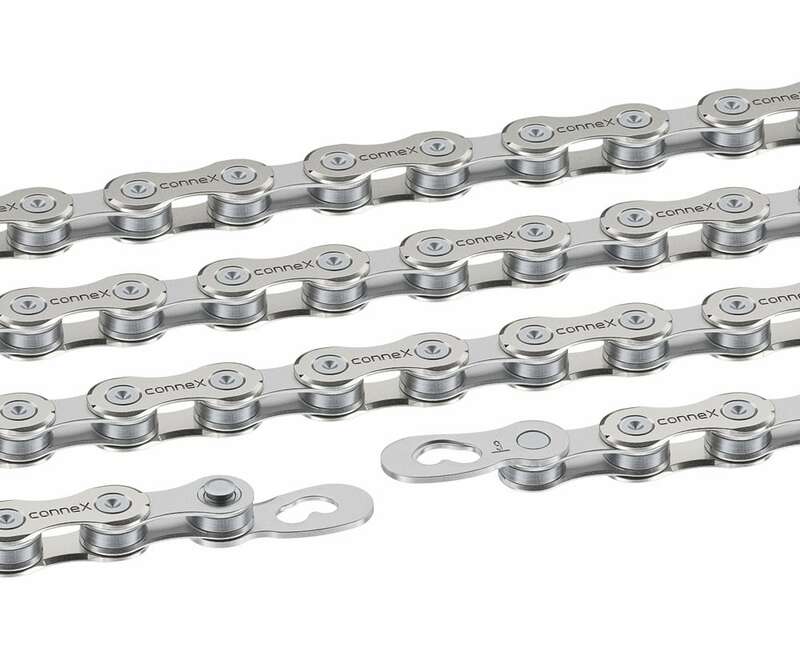 With a new chain, the load is distributed most of the way around the chainring or cassette cog. But when the chain wears, all of the load is taken by the chainring tooth at the top as the chain feeds onto the chainring, and the top cassette cog as the chain flows off of the cassette. So, keep your chain in new condition and your chainrings and cassette cogs will last much longer. Connex chains will stay in like-new condition longer than other chains. 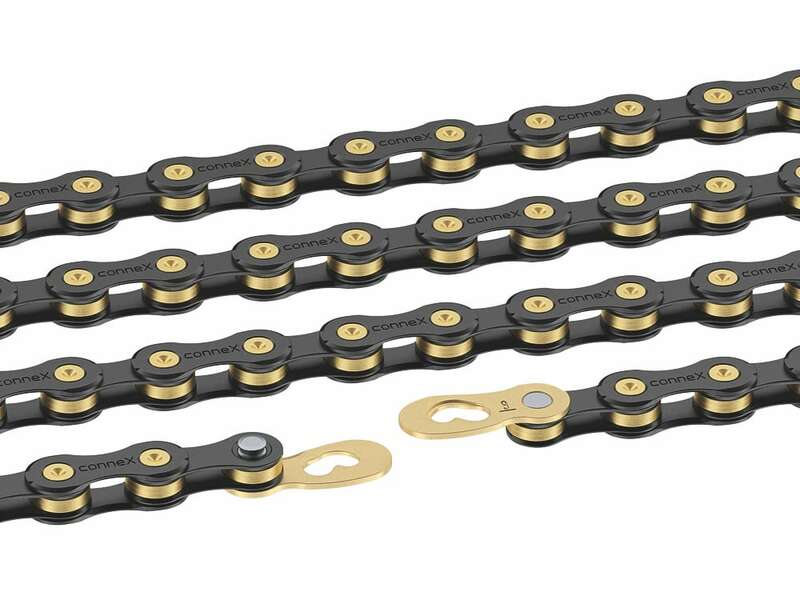 Of course, all Connex chains include the Connex link, which makes assembly and disassembly of the chain for installation and cleaning quick, easy and reliable. The Connex Link can be opened and closed as many times as you like. It's always secure, unlike many other "one time use" solutions. 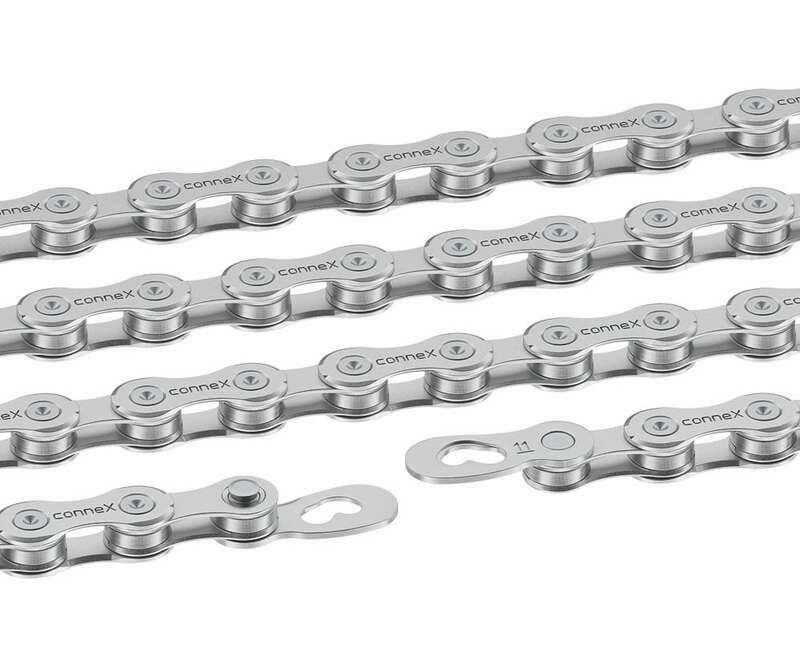 The Connex link must be installed in the correct alignment, otherwise you'll get a clicking sound when using very small cassette cogs like 12 and 11 teeth. Please follow the included instructions. When joining the chain between the lower rear derailleur pully and the bottom of the chainring, the number on the Connex Link indicating the speeds the chain is made for should read "right side up". 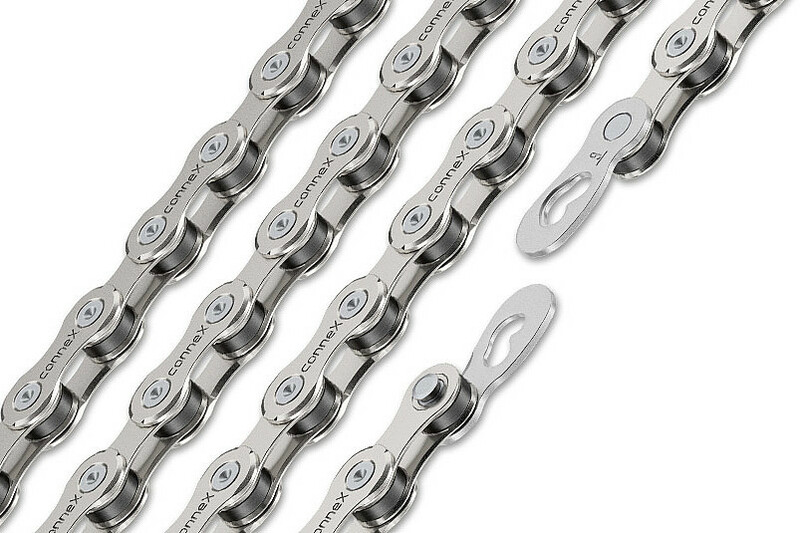 So for example if you have a 9 speed chain, the number "9" should be readable right side up from the right side of the bicycle. 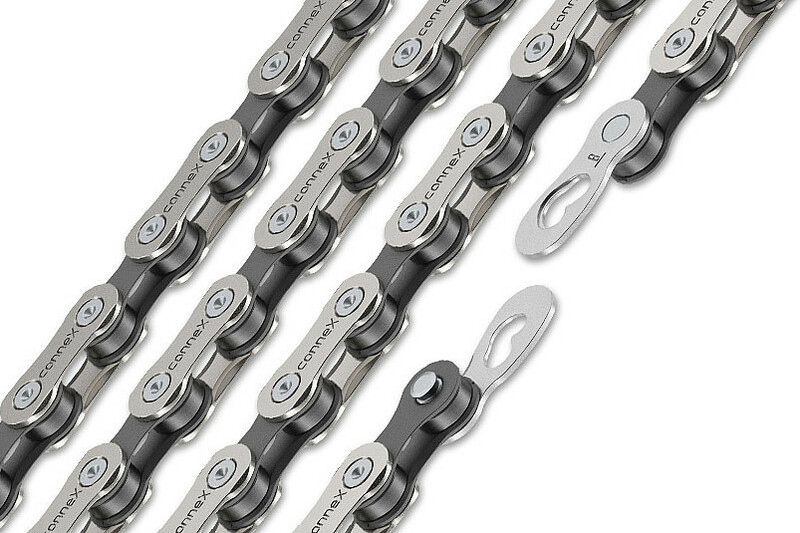 If you've already bought one of those "other" chains, of course you have my deepest sympathy, but you can still use the reuseable Connex link to make cleaning a whole lot easier. 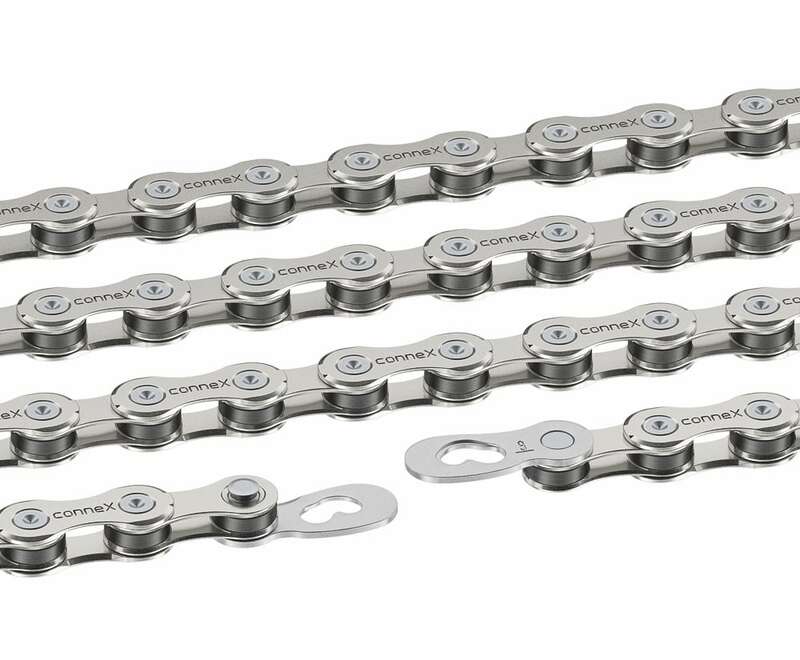 I stock them in widths for 8, 9, 10 and 11 speed chains. Please scroll towards the bottom of this page for the Connex Links sold separately. Speaking of those "other" chains, I recently took off a SRAM 1071 chain with only 300 miles on it to test a Connex 10SX chain on my road bike. I use a TA Podium cassette, 14-28 ten speed, and TA Zephyr rings, 48-38-20 on a Zephyr triple crank with an Ultegra 9 speed triple front derailleur and Ergo shifters. The rear shifting was great with a Jtek Shiftmate and the SRAM chain, and most shifts in front were good, with the exception of the shift from the 20 tooth inner to the 38 tooth middle chainring. That is a huge jump so I never blamed the chain. However, with the Connex chain the shift from the 20 to the 38 is much quicker. And, since when I'm using the 20 tooth chainring I'm also using either the 28, 25 or 23 tooth cassette cog, that means I'm going really slow up a steep climb. When I get to the top I want to shift onto the middle chainring, the 38. With the SRAM chain it would usually make the shift, if slowly with a lot of chatter. But with the Connex it clicks in not just quicker, but it gets onto the chainring every time. With the SRAM chain I would often come to a stop before it made the shift. Not with the Connex. I really like this chain! 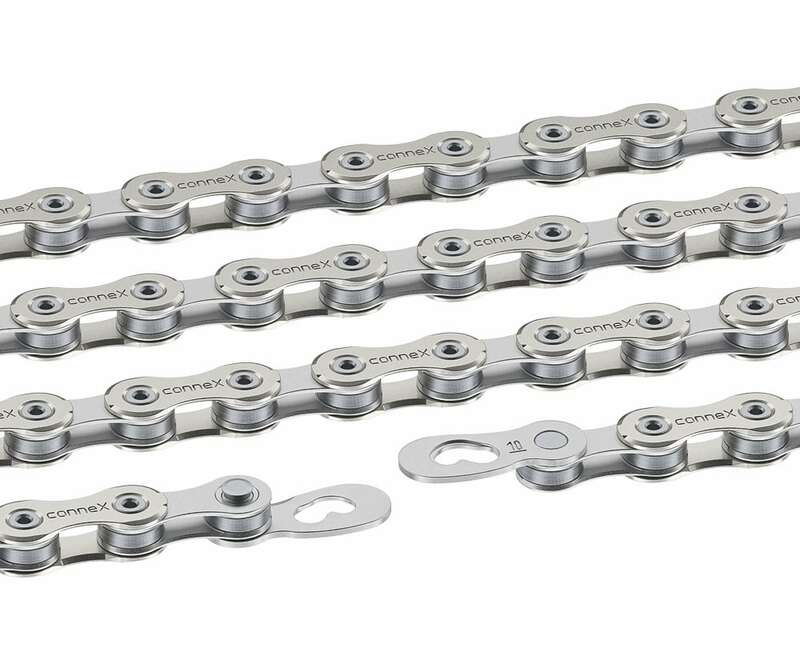 And, your local bike shop can order these chains from us since we are a direct importer and distributor for Connex chains. Connex chains and links are in stock. Stainless rollers and inner plates for extreme durability. Nickel plated outer plates. Photo of the 9 speed version. 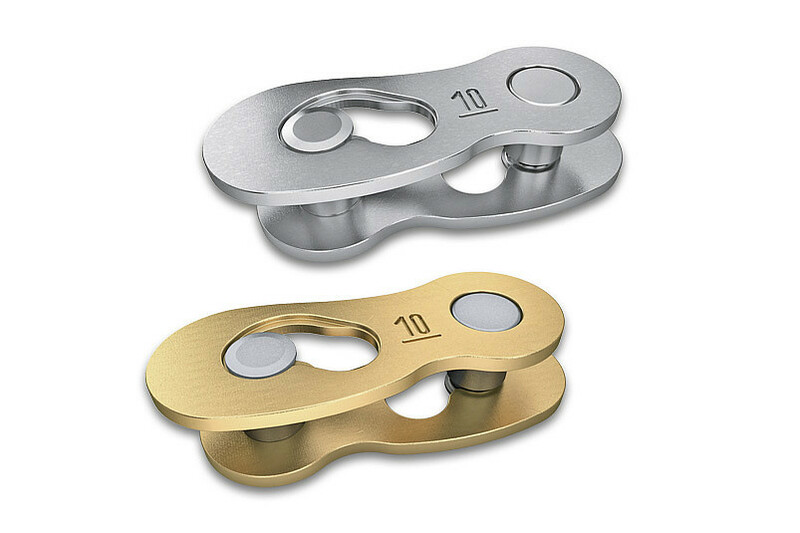 Brass plating for a beautiful appearance. Nickel plating for a beautiful appearance. Unplated for low cost. Keep well lubricated for riding in the rain. Hollow pins for reduced weight. Black plated outer plates. Stainless inner plates black plated. Brass plated pins and brass plated stainless rollers. This photo is of the 8 speed version and only represents the finish of the 10S0 chain. 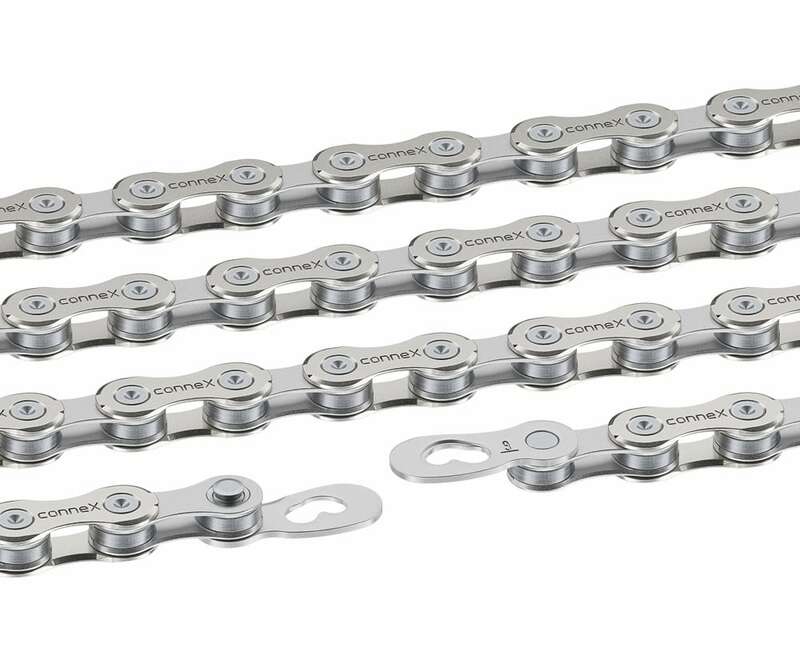 The shape of the plates and all dimensions are actually the same as the other 10 speed chains. Black plated outer plates. Stainless inner plates black plated. Brass plated stainless rollers. Nickel plating on outer plates for a beautiful appearance. Stainless rollers and inner plates for extreme durability. Nickel plated outer plates. Suitable for all 8, 7 and narrow 6 speed drive trains. Photo shows the color of the 8 speed chain, but the outer plates are shaped differently. See photo of 808 below to see the correct shape of the outer plates. Accurate photo to come. Nickel plating for a beautiful appearance. Suitable for all 8, 7 and narrow 6 speed drive trains. Nickel plating on outer plates for a beautiful appearance. Suitable for all 8, 7 and narrow 6 speed drive trains. Unplated for low cost. Keep well lubricated for riding in the rain. Suitable for all 8, 7 and narrow 6 speed drive trains. 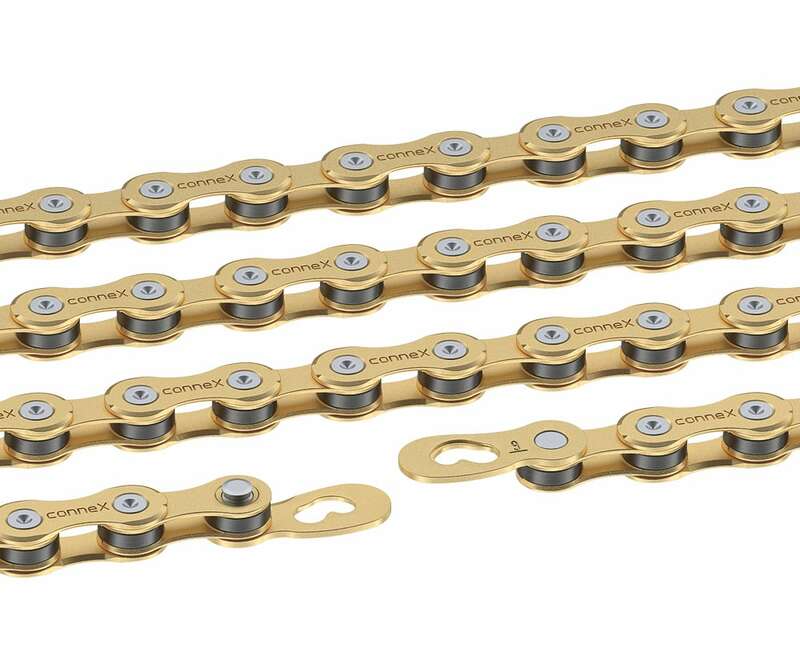 Remember; all Connex chains come with the Connex Link. We also sell them for those poor unfortunate folks who succumbed to the temptation of buying a different brand of chain.